Premier Li Keqiang responded to questions from reporters at a news conference at the Great Hall of the People in Beijing after the conclusion of the national legislature’s annual session on March 16. Here is the full transcript of the 17 questions and Premier Li’s answers. Reuters: The recent volatility in China’s stock and currency markets have drawn close attention from international investors. Mr Premier, what do you think are the major problems and challenges facing China’s financial markets? What are the Chinese government’s plans for future financial markets and strengthening of financing regulation? What major reform steps will be adopted for the development of stock, currency and bond markets in China? Will the recent volatility in those markets hold back China’s reform development? And will the Shenzhen-Hong Kong Stock Connect be launched this year? Premier Li Keqiang: You’ve had the first opportunity to ask a question, and you made your questions all about the financial sector. That is understandable, as many economic problems first manifest themselves in financial markets. The top priority of the financial sector is to support the development of the real economy. The truth is, the dysfunctional real economy presents the largest risk to the financial markets. Last year, we took a series of steps, including cutting interest rates, and targeted reductions of banks required reserve ratio; these were not quantitative easing measures. At the same time, we also took care to insure that there is appropriate money supply. All these steps will aim at bringing down the cost of financing and enhance the development of the real economy, so I believe the job of financial institutions is to provide better services to the real economy, especially micro and small businesses. The financial sector also operates according to its own laws, and one should always look out for possible financial risks. Last year, because of the difficulties of companies in some sectors, the nonperforming loan ratio of some financial institutions in China increased, but we are still in the good position to defuse the financial risks because the capital adequacy ratios of commercial banks is still about 13 percent, which is below the international warning line. Those bank’s provision coverage ratio is also about 180 percent, which is above the 150 percent level that we set. We also have other market-based tools at our disposal to help bring down the corporate debt ratio. A very high corporate debt ratio is not new in China, as they still raise finances mostly indirectly in China, but we have a high saving’s rate. In regard to volatility in the financial market, we’re determined to press ahead with the building of a multi-tiered capital market, and we can also used such a market-oriented format for equity swaps to help bring down the corporate leverage ratio. Last year, due to multiple factors, there were some unusual fluctuations in China’s stock markets. Public departments took coordinated steps to stabilize the market and prevent any sustainable financial risk, and our measure achieved the desired result. As to what will the government do the next, with respect to the development of the financial markets in China, a few days ago, our newly appointed chairman of the China Securities Regulation Commission already give elaborate answers to that, so due to time constraints I will not spell them out here. Whether it is stock markets or bond and currency markets, they are after all markets, so we will continue to pursue market-oriented reform and establish a sound, legal framework for the operation of those markets. The government has the regulatory obligation, and we still need to improve our regulatory system in China. First, there needs to be full coverage of financial regulation, as we are seeing an increase in financial innovation products. Second, we need to step up coordination because all these financial markets and products are so highly interconnected, and such coordination must be authoritative. Third, responsibility must be matched with power; governments, departments and local authorities must perform their assigned possibilities conscientiously and promptly handle any possible latent risk, and also guard against moral hazards. Basically, we must sharpen our vision to exercise the most-effective regulation. Xinhua News Agency: Some people are worried that China’s growth might fail to reach the target or even below 6.5 percent. What’s your view? Premier Li Keqiang: You raised a big question. But it is impossible for me to agree that China cannot achieve the growth target this year. The weak world recovery has taken its toll on the Chinese economy, which is deeply engaged in the world economy. China’s economic transition is under way and its deep-rooted problems are emerging. The downward pressure indeed is increasing. But one prominent feature is greater divergence among regions and industries. The other day I read a foreign media report saying that one visit to a heavy industry left the impression of depression, while the next stop to a technology park left the impression that the economy is growing at a double-digit rate. This is in line with my last year’s field trip conclusion: hope and challenges coexist. If we look at the “fundamental” and “big trend”, hope outweighs challenges. We are fully confident about China’s long-term growth prospects. This confidence is not groundless, because we believe that there will not be a hard landing as long as we stick to the reform path. There is still huge potential for China’s markets; the general public has unlimited creativity. The government has overreached its aims in many aspects of economy, which hindered the gains of productivity; we are also not doing a sufficient job in ensuring a level playing ground. I believe through reform we can stimulate more vitality in the market, and greater vigor of the people. The wisdom and hard work of our people, if well tapped, is enough to withstand downward pressures. The deregulation and tax cuts of the past few years will unleash the vitality of the market. Meanwhile, new forces of economic growth drivers are taking shape in a way that beats expectations. Despite the slowdown over the past few years, the employment condition is not bad. Last year we created more than 13 million jobs in the urban area. In the first two months of this year, the service sector grew 8.1 percent. Among them, there is high-tech research development, which is giving a push to the upgrade of traditional industries, an area where there is so much work we can do. We are in the midst of pushing ahead with deindustrialization and urbanization. New-style urbanization is the large domestic demand, especially in central and western regions, where there is enormous room for effective investment. If we combine the “fostering of new drivers” and “upgrading of old engines” and make them the “double-engines” of the Chinese economy, it will go through the pass of difficulties and leap to the plateau of hope. The “stress test” we have been through, in another way, is a precious experience. I believe that under the leadership of the CPC central committee with Xi Jinping as general secretary, as long as the new vision we have deployed unites the people’s efforts, we will be able to deliver a good start to the 13th five-year plan, which will bring a warm breeze to the world. Premier Li Keqiang: I just want to add one thing to part of the question raised by the Reuters journalist regarding when the Shenzhen-Hong Kong stock connect will be launched. We have already launched the Shanghai-Hong Kong stock connect and a lot of experience has already been gained from its operation. That stock exchange connection has brought real benefits to both cities. Currently, authorities in the mainland and in Hong Kong are in intensive discussions, and we will work toward the launch of the Shenzhen-Hong Kong stock connect within this year. NBC: I’m with NBC. Respected Premier Li, your work report has outlined steps to China’s economic growth, which should help the global economy. But there is one factor of uncertainty and that is the continuing dispute between the world’s two largest economies over a range of disputes. So Mr Premier, what do you propose can be done to improve the China-US relationship and address American concerns with respect to market access, investment restrictions, level of fair competition for American companies or fair trading practices that did not steal American jobs, issues that have been raised by some candidates in the current US election campaign. Thank you. Premier Li Keqiang: There are broad interests between China and the United States. There are also some differences between the two countries, and some differences could be quite sharp. There is no need to deny this. For some time it seems that many people have been talking about differences between the two countries, yet at the same time have overlooked one very important thing that happened last year, that is China became the United States top trading partner, with two-way trade reaching $560 billion. This in itself shows that the common interests between the two countries are constantly expanding, and (the common interests) far outweigh their differences. As for how to ensure the healthy development of China-US ties, I believe both countries need to act in keeping with the principles of equality and mutual benefit. Currently the two countries have stated readiness to press ahead with Bilateral Investment Treaty negotiations. China, on its part, will give US investors wider market access in a gradual manner, but we hope such openings would be mutual, and the BIT negotiations should proceed on the basis of seeking mutual benefit. I believe the common interests between us will constantly expand. As for the differences between the two countries, there are up to 100 various dialogue and exchange mechanisms between China and the US. As long as the two sides act with good faith and properly manage their differences, I believe our common interest will further expand. And as our cooperation expands, the number of differences may naturally rise, but the percentage of differences in the overall China-US relationship will only come down. Broader cooperation serves the interests of both countries and the world. Business cooperation between our two countries has always been mutually beneficial, something that I believe the US business people know best. As for the ongoing general election in the US, it has been lively and has caught the eyes of many. I believe that no matter, in the end, who gets into the White House, the underlying trend of China-US ties will not change. It has been several decades since the two countries established diplomatic relations, and the relationship has seen more than a fair share of ups and downs, but it has been always moving forward, which I believe is the underlying trend. China News Service: Governments in some localities are having difficulty in paying pension benefits. Governments of some cities and counties have even borrowed money to make the payments. My question is, will the central government sit by and be hands off, or will the central government foot their bills? Premier Li Keqiang: You raised quite a sharp question. Honestly speaking, it is true that some localities have found it hard to make pension benefits payments, but these are only isolated cases. Now the pension schemes in China are managed at the provincial level. Our provincial governments have the responsibility and capability to raise funds through various channels to ensure the payments for pension benefits. If local governments have done their best, but still have special difficulty, the central government is prepared to extend help. In the past three years, the central government has earmarked one trillion yuan in this respect, make no mistake, local governments must exert their utmost, and the central government will supervise local governments to make sure that pension benefits are paid on time and in full. One day, we will all be retired and live on pension benefits. So here’s the message of reassurance. That is, nationally speaking and in the long run, there will absolutely be no problem in meeting pension payments by the Chinese government. Last year, the surplus of our pension insurance schemes was still at 340 billion yuan, and accumulative balance was 3.4 trillion yuan. Moreover, we still have the central social security fund, which is worth 1.6 trillion yuan, as a strategic reserve that has not been touched, and we can also use State-owned assets to replenish the social security fund. So, ensuring that the elderly will be provided for cannot and will not be an empty promise. Bloomberg News: Mr Premier, in this news room last year you said China is determined to press ahead with reform that would be as painful as taking a knife to one’s own flesh, and in this year’s government report you talked about the need for a minimum 6.5 percent growth target, and we have also heard local officials saying there will not be layoffs as China presses ahead with overcapacity. So I am wondering how would you address concerns that the growth target and the desire to avoid potentially layoffs would bind China’s hands and make it impossible to press ahead with reform that you said is crucial for Chinese economy? Premier Li Keqiang: One thing is certain: that we are determined to push ahead with our reform agenda. Reform and development are not in conflict with pursuing structural reform. We can further release market vitality and drive economic development. It is true that in some sectors there are serious problems of overcapacity, especially in heavy industries and petrochemical industries. We have selected the steel and coal sectors to start with the effort of cutting overcapacity and at the same time we will also avoid massive layoffs. In the past two years, we have been faced with up to one hundred million tons of steel making capacity involving some one million employees, with a high priority given to protecting the interests of employees. We have taken strong steps to resettle these people and give them re-employment opportunities, and good experience have been enjoyed from the process. In a word, we will press ahead to deal with overcapacity and at the same time make sure that there will not be mass job losses. We will assign possible laid off people to new jobs and for those who still have difficulties in getting employment opportunities, the central and local government have financial resources to cover layoffs. The central government has established a 100 billion yuan fund in this respect, and if there is a need we could increase that amount. In the meantime, local governments have to do their own jobs. We hope to make it a win-win process and will strive to strike a proper balance in between. In the process we hope that by cutting overcapacity in those heavy industries, we will bring about a sustained and sound growth in these sectors. People’s Daily: Just now you said that the government will continue to streamline administration and delegate power to stimulate market vitality, so my question is about this government reform. This reform has been going on for several years, but some companies and people still feel that it’s difficult for them to get some things done. In some cases, they even feel quite at a loss as to what to do. My question is, what will the government do to proceed with this reform? Premier Li Keqiang: Streamlining administration and delegating powers holds the key to transforming governments’ functions. Three years ago, on the same occasion, I promised that this government would cut the number of items that require State Council review and approval by one-third during its term. We have already fulfilled this target. Based on third-party evaluations, most of the companies and our people are satisfied with the progress of the reform. Yet, some problems still exist, and our people expect more from the government. At present, there are still too many items that require government approval. For those items that do need to exist, there is a lack of unified standards. A few days ago, in my discussion with some representatives of NPC deputies, one of them said that they wanted to establish a local nursing home that combines medical care with elderly care. It’s a very popular idea with the local people. But many of them feel quite at a loss as to what to do, because there are different standards and they need to go through a host of government review procedures, involving market access, departments in charge of designated places for medical insurance, and how fees are going to be collected or set, etc. So all these redundant procedures have held back the development of productivity and also effective consumer demand among people. Spanish News Agency EFE: Just in the last two months, actions of the Democratic People’s Republic of Korea have got the United States to increase its military presence in the Republic of Korea. At the same time, military tensions have increased in the South China Sea. And now Australia is in talks with the US in order to host strategic plane bombers in its territory And in the trade area 12 countries, not including China, have signed the Trans-Pacific Partnership. And my question is putting these together do you think that President Obama’s focus in the Asia-Pacific region has already become a problem for China? Or do you see any other sources of instability in the whole Asia-Pacific area? Premier Li Keqiang: It seems that all your questions are related to China’s neighborhood. So let me say that China all along believes in pursuing harmonious coexistence with its neighbors, and we always believe that we need to have a stable neighborhood environment. China is now pursuing modernization, hence development remains our top priority. China needs a stable neighborhood and a peaceful international environment for its domestic development. And a growing China will remain a staunch force for upholding global peace and it is also in the interests of China’s neighbors. China will remain committed to the path of peaceful development and China will not waiver in its resolve to uphold sovereignty and territorial integrity and these two are not in conflict. Well we hope all countries from within this region and without will work together to uphold regional stability, not the opposite. That is in the interests of all. China Radio International / CRI Online: In the agenda of the State Council’s executive meetings ahead of the two sessions, there was a highlighted item about preservation of cultural relics. So my question is, with a country so big, facing so many problems and the government being so busy, is this issue of protecting cultural relics such an important issue? Premier Li Keqiang: Thank you for your keen interest in the State Council’s executive meetings. The preservation of cultural relics is to boost cultural development in our country, enhance our moral strength and pass over our traditional culture. It will also help us to achieve balanced economic and social development. For the many problems that have occurred in our economic domain, such as cheating, swindling of the market place, selling fake goods, or loss of the good faith. One may also try to find causes behind those problems at the cultural level and make cultural prescriptions. The market economy is an economy on the basis of the rule of law with moral principles. So to develop culture will help us enhance moral strength in the course of pursuing modernization. We should not only work hard to create rich material wealth, but also meet our people’s growing cultural needs and win the respect of other countries with the strength of culture and civilization. Thank you. Phoenix TV: In the past couple of years whenever we come to the mainland, we are often asked what has happened with Hong Kong. There is so much to this one simple question and also the Mong Kok riots that took place on the first day of China’s Lunar New Year exposed some problems that exist in Hong Kong’s society. Hong Kong’s economic growth has also been slowing. Mr Premier, next year marks the 20th anniversary of Hong Kong’s return to the motherland, many people in Hong Kong are asking this question: where will Hong Kong go in the future? What is your answer to that question Mr. Premier and will the central government introduce more policies to support Hong Kong’s development? Premier Li Keqiang: Next time you get asked about this question, I suggest that you can answer that Hong Kong will maintain long-time stability and prosperity. The policy of the central government of adhering to “one country, two systems” — the Hong Kong people governing Hong Kong and high degree of autonomy will not change, and this policy has not changed. We believe that the Hong Kong SAR government has the ability and Hong Kong people have the wisdom to properly handle the complex issues in Hong Kong. The development of Hong Kong is needed by Hong Kong itself and also the country as a whole. Hong Kong’s development ultimately comes down to the efforts made by the people in Hong Kong. As an advanced economy, Hong Kong achieved a (GDP) growth of 2.4 percent last year, which is not low at all. Hong Kong can further use its own strength and also seize the opportunity offered by mainland development. The central government will give full support to any proposal from the SAR government that helps maintain Hong Kong long-term stability and prosperity and contributes to the well-being of people in Hong Kong. I have a confidence in a bright future of Hong Kong. Caijing: In this year’s Government Work Report, the concept of the new economy was put forward for the first time. I wonder if this concept refers to e-commerce and those micro and small businesses? What does it have to do with the campaign for mass entrepreneurship and innovation? And how helpful could it be for withstanding the downward economic pressure? Premier Li Keqiang: To develop the new economy will help us foster new economic drivers and move forward China’s economic transformation. The concept of the new economy covers a wide range of areas and has many dimensions. It can be found in the primary, secondary and tertiary industries. It’s not just about emerging forms of business and industries such as e-commerce, cloud computing, the Internet of things and Internet. It can also be found in smart manufacturing, large-scale customer-made production in the industrial sector. It’s also about the appropriately scaled-up operations in the primary industry, that is agriculture such as family farms and shareholding cooperatives. We believe that micro and small businesses can do a lot in developing new economy and also large companies can make a big difference. The truth is many large companies in China have established their own makers’ spaces. There are many such examples. Russia Today: Both China and Russia have recognized that the business cooperation between the two countries is lacking behind the growth of their political ties, and both sides have promised to change the situation by promoting trade ties and also investment cooperation. However, we have not seen a large inflow of Chinese investment in Russia yet. What is the reason for that? Is it because of the Western sanctions against Russia or Russia’s own economic situation? Are Chinese companies under pressure from the United States and other countries in cooperating with Russia. Moreover, some Chinese experts believe that China is not that interested in making investment in Russia, but only interested in getting Russia’s cheap energy. What is your response? Premier Li Keqiang: China and Russia are each other’s biggest neighbors, there is a comprehensive strategic partnership of coordination between the two countries. This relationship is an all-dimensional one. President Xi Jinping and President Vladimir Putin have met with each other quite often, there is a close political relationship between the two countries and our business cooperation has been continuously rising because we have multiple operations in quite many fields. China has all along developed its relationship with Russia on the basis of mutual respect and mutual benefit, and China pursues an independent foreign policy of peace. China-Russia relations will not be affected by changing circumstances in the international environment, and will not cave to third-party pressure. In the meantime, China follows the principle of nonalignment, and China-Russian cooperation will not be targeted at any third party. Just now I said our business cooperation has also been rising. For example, last year, Chinese imports of oil from Russia increased by eight million tons, but because of plummeting commodity prices on international markets, China’s total imports and exports declined, not just its imports from Russia. The physical volume has gone up, by the total trade volume has come down because of the falling prices, and neither country is responsible for that. Last year I had a deep discussion about China-Russia business cooperation with Prime Minister Dmitry Medvedev, we agreed that we can explore cooperation in the integrated development of oil and natural gas, sectors that will help attract more Chinese investment, and we can also introduce a greater level of diversity into our trade mix. I hope that next year, if you come to this press conference again, I can tell you that the business ties between our two countries have turned the corner for the better. China Daily: Ahead of the two sessions this year, China Daily and its app conducted an online voting survey, in which 24 million netizens participated. All the 10 questions on the survey are closely connected with people’s daily life. Top of the list was how to achieve national portability of medical insurance schemes, which received 10 million votes from netizens. Mr Premier, is there a timetable for us to achieve national portability of medical insurance? Premier Li Keqiang: I want to first thank you for conducting the survey, asking the people what the top concerns are in their daily lives. That will certainly help the government do its job better. I’ve also heard a lot about the retired elderly people moving to places away from their hometowns to live with their children. And they are even taking on the responsibility of taking care of their children’s children. But when they get sick or hospitalized, they cannot easily get their medical expenses reimbursed in places where their expenses occur. It may seem a very concrete and specific issue. But when viewing it in the context of one single family, it could be a paramount issue. The Chinese government is fully determined to achieve national portability of medical insurance schemes at a faster pace. This year we will basically achieve direct settlement of such expenses at the provincial level. And we also plan to use two years of time to achieve the direct settlement of hospitalized expenses by retired elderly people in places away from their hometowns, so as to remove this high concern in the minds of our people. This requires that all relevant government departments make tremendous efforts. All the government’s work is to improve the well-being of our people. So we need to use the concrete wishes for a better life by our people to drive our development, and reform and test the results of our reform. CTI Television Incorporation: There has been a change of ruling party in Taiwan this year. There is a perception that the change will bring uncertainty to cross-Straits relations. I would like to ask for your opinion about the prospects of cross-Straits relations. Will the mainland introduce more measures that will help boost cross-Straits relations, business cooperation and improve people’s livelihoods? Premier Li Keqiang: Peaceful development of cross-Straits relations is in interest of people on both sides of the Taiwan Straits. Economic and social ties between the two sides are also becoming increasingly close, and there needs to be sound interaction between the two sides. Last year, I paid a field trip to Fujian province, where I had a round-table with some Taiwan business people. Many of them were quite sensitive about any economic measures from the mainland and some were considering whether the preferential policy for Taiwan businesses will be changed. Their point was well taken and we quickly issued a document specifying that all the introduced preferential policies for Taiwan businesses will remain unchanged to make them feel reassured. Why did we do that? Because we are all members of a big family. We will introduce more policies to boost business cooperation between the mainland and Taiwan on the premise that there will be continued peaceful development of cross-Straits relations and the footstone of it is the 1992 Consensus. As long as one adheres to the political foundation of the 1992 Consensus and recognizes it, that both mainland and Taiwan belong to one and the same China, anything can be discussed. I for one feel optimistic about the future of peaceful development of cross-Straits relations. There is a strong tie between the two sides that cannot be severed. I also believe that closer business cooperation could bring benefits to people of both sides. Premier Li Keqiang: Streamlining administration and increasing transparency of government affairs are both essential for transforming government functions. There is no problem with the firm resolve of the central government to increase the openness of government affairs, and further steps will be taken in this respect. First, any information that can be made public should be released. So openness will be standard practice, whereas the lack of this an exception. More information needs to be made public if it concerns an issue that involves public interests or it concerns the balance sheet of public finances. We should make government information as easily accessible for our people as just one click away. Second, we need to upload as much information as possible onto the Internet. We need to release the government list of powers, and this will help us narrow the space for any fraudulent use of office. People used to say, “As man is doing, heaven is watching.” I guess in this era of cloud computing, it should be, “Cloud is watching, watching how power is being used,” and in the exercise of power by governmental departments, there should be no practice of making calculating moves for personal gain. Japan’s Nikkei Business Daily: I have a question about the meeting of leaders from China, Japan and the Republic of Korea. Last year this trilateral leaders’ meeting was resumed in Seoul, in the ROK, and this year Japan is the host of the trilateral leaders’ meeting. We believe that there are many areas where the three countries can work with each other, for example, in addressing the DPRK nuclear issue and in pursuing the free-trade agreement involving the three countries. So my question is what are your expectations for the trilateral leaders’ meeting this year? And in order to attend this meeting, you will for the first time go to Japan in your current capacity. 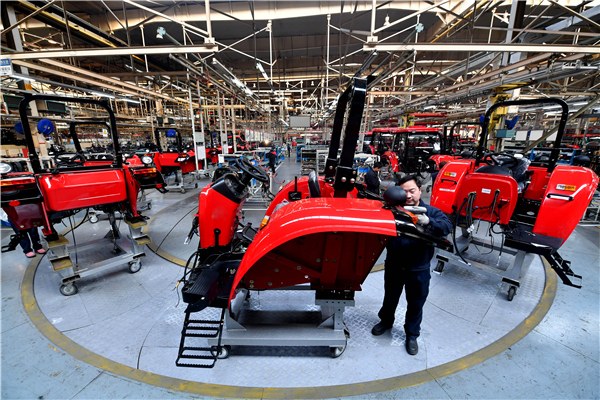 Some experts also believe that Japanese companies can play a big role in helping China achieve economic transformation. So I want to ask for your prospective on the economic complementarity between China and Japan? Premier Li Keqiang: Last year I went to the ROK and attended the trilateral leaders’ meeting. This meeting should have been an annual event, however, it was only resumed last year after a three-year hiatus, and this has not come easily. As to whether the format will enjoy smooth development in the future, it’s very much up to the interactions among the three countries. In particular, there has been some signs of improvement of Sino-Japanese ties, but it is not fully established yet and it is still fragile. We believe that it is important to adhere to the consensus reached between the two sides on the issue of principle involving history, and it is important to match one’s words with concrete actions. What I don’t want to see is another disruption in the holding of such a meeting. CCTV: A question about contributions by the general public and businesses to the five major social insurance programs and housing provident fund. There is a rising call by the general public for cutting personal contributions to these social security packages and housing provident fund. A very typical case is that if you take a look at the wage list of individual, he may earn 8,000 yuan but he can only get actually less than 5,000 yuan, and the rest over 3,000 will be contributions to the social insurance package and the housing fund. Businesses also feel that they are under heavy burden to pay such contributions. Both hope that contributions can be brought down. But we also know that on the other hand, the funding financial resources and social security schemes may have been over-stretched. So I want to ask you, Mr Premier, how would you respond to the public concern and how will the government resolve this issue? Has this issue being put on the government work agenda? Premier Li Keqiang: During the two sessions, some NPC deputies and CPPCC members have also suggested that appropriate adjustments be made to the proportion of contributions to these insurance schemes and fund by public and business community. The central government, the CPC Central Committee and State Council have paid very high attention to this issue. Last year, the State Council already adjusted downward the contributions by individuals and businesses to the insurance scheme covering places, safety, unemployment and maternity. On the whole there’s still room for us to cut the contributions to these insurance schemes and fund and conditions of different localities vary from each other. As I said before, we still have ample social security funds and local governments can be given great autonomy to make their own decisions of adjusting downward such contributions in keeping with their local conditions. All in all the purpose of our effort is to lessen corporate burden and put more money in the pockets of our people. Thank you! Farmer’s Daily: Last September when we were about to harvest corn, the central government introduced adjusted price for the purchase and storage of corn and the price was cut by 20 percent. That brought huge losses to corn growers. We know that this is also part of the supply side structural reform to adjust agricultural structure. But we want to have your take on this issue. What further steps will the central government take with respect to the price of grains in China? Premier Li Keqiang: The average price in China is about 600 yuan ($92) per ton higher than international price. That is mainly because our labor productivity is still quite low. So in the future, we are going to pursue coordinated development between new type urbanization and agricultural modernization to help more migrant people move into urban areas.